(SPOT.ph) With most Pixar films, you kind of expect what you're going to get—great animation, lovely storytelling, dynamic characters, hilarious sequences, and dramatic moments that will have even adults reaching for tissues–and the animation studio's latest effort, The Good Dinosaur, is not lacking in those departments. Director Peter Sohn, whose one and only previous directorial effort was the adorable Pixar short Partly Cloudly (and is a voice actor for many of Pixar's films including this one), and writer Meg LeFauve (who also worked on Pixar's other 2015 release, Inside Out) tread familiar themes and plot devices in this coming-of-age dinosaur-western (yes, The Good Dinosaur is a smorgasbord of things), but the film stil manages to tell a sweet, but equally heartbreaking tale about friendship and family through the use of some jaw-dropping animation. The film begins with a sequence that depicts an asteroid missing the Earth, thus never making the dinosaurs extinct. Years pass and dinosaurs roam the land alongside other animals and even some humans, and the particular family of Apatosauruses we follow is a farming family, harvesting crops and such. Our lead dinosaur is Arlo (voiced by Raymond Ochoa), the smallest of three offspring from the wise and hardworking Poppa (Jeffrey Wright) and the strong and loving Momma (Frances McDormand). Arlo, small and frightened, struggles with the hard labor in the farm. The first 20 minutes of the film spends a lot of time shoving this fact in your face, and it's not the most pleasant opening to a film. Heavy-handed sequences where Arlo's father tries to teach him life lessons (which he spells out), and much too literal and oft-repeated talk about "making your mark" and "getting past your fear" fill this part of the film, as well as moments we won't discuss for fear of spoiling the movie. Once Dinosaur gets past the first act, then we get to the good stuff. While trying to prove himself and "make his mark," Arlo gets swept away by the river and ends up alone and in the middle of nowhere. Soon, he's helped by a wild human boy that Arlo then names Spot. Spot is the complete opposite of Arlo—he is ruthless, untamed, and brave, which inspires Arlo to keep going and try to find his way home. The two form a bond while trying to survive the harsh elements, and the wildlife that surrounds them, including pterodactyls, T-rexes, and other dangers. It's a coming-of-age adventure story that's veiled under a Western, and it's quite the combination of genres for this emotional experience about getting over your fear and finding your family. Pixar definitely delivers when it comes to the emotion and the power of the story they are telling, especially from the second half onwards. Like WALL-E, Up, and several films before it, The Good Dinosaur's best parts are when the dialogue is thrown out the window and the storytelling is done visually. After the wordy and saccharine first act, there are long stretches with little to no dialogue that builds Arlo and Spot's relationship, as well as give us insights on both of their characteristics. We all know how Pixar can draw the strongest emotions out of the simplest things (see: Andy pulling Woody back in Toy Story 3), and in Dinosaur, a beautiful, small, wordless scene with sticks (sticks!) will make many people weep like babies. 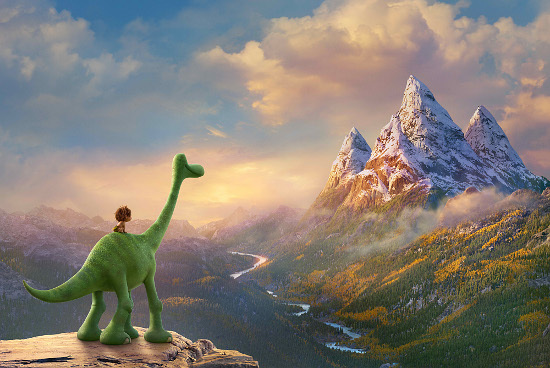 The whole film isn't like this, and there are loud, Western-influenced sequences along the way, but when it finds the little, quiet moments, The Good Dinosaur is stunning. What is also stunning is some of the most beautiful, photorealistic animation ever seen on screen. The film's recreation of the mountainous American landscape as well as all the water and underwater sequences are jaw-droppingly gorgeous. 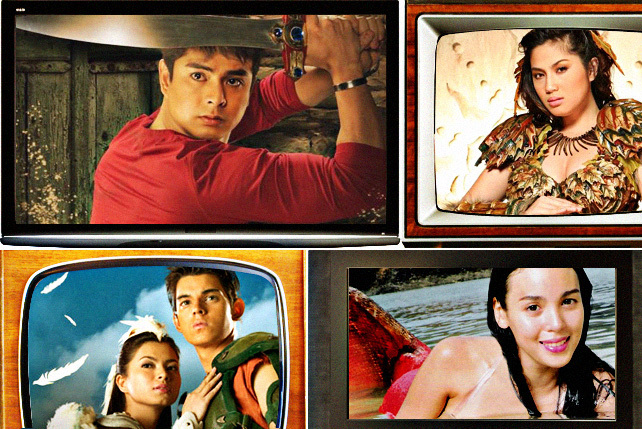 As good as these all are, the film does have weak points. Coming so soon after Pixar's other 2015 megahit Inside Out, The Good Dinosaur is a tiny bit hurt by the former's complex narrative and wholly original premise. 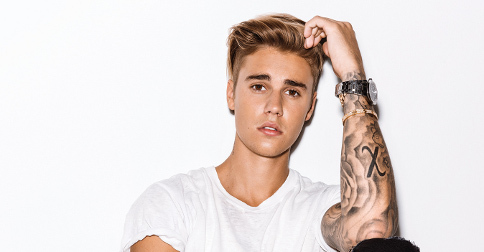 The film flips the "boy and his dog" story we know, instead of having it be a "beast and his boy-dog." It's a fun role-reversal, and the film definitely plays it for laughs, but the rest of the plotline and the themes they cover are all very much things we've encountered before, even in prior Pixar films, making the film feel very familiar. There are also clear references to films like Jurassic Park and The Lion King. It will be easy to spot all the narrative devices used in prior coming-of-age adventure flicks like surviving mother nature, avoiding a waterfall drop, visions and dreams, eating the wrong fruit, and so on. While this does bring Dinosaur down a few pegs on the originality scale, the Pixar-esque execution brings it back up, and the film still hits hard when it needs to. It's funny, heartwarming, and exciting. There are some near-grotesque moments that, while played for laughs, may scare little kids, but will have older ones and adults howling. 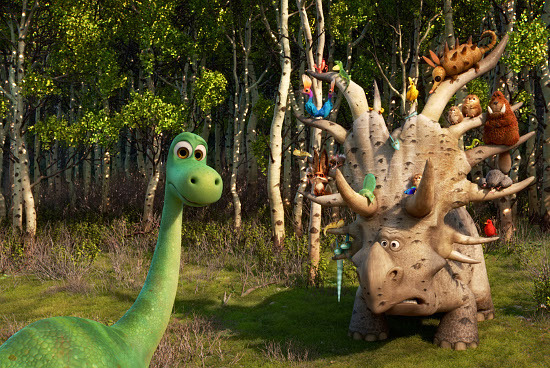 The Good Dinosaur may not be Pixar's most original, but it does fit nicely with their wonderful, ever-growing ouevre. 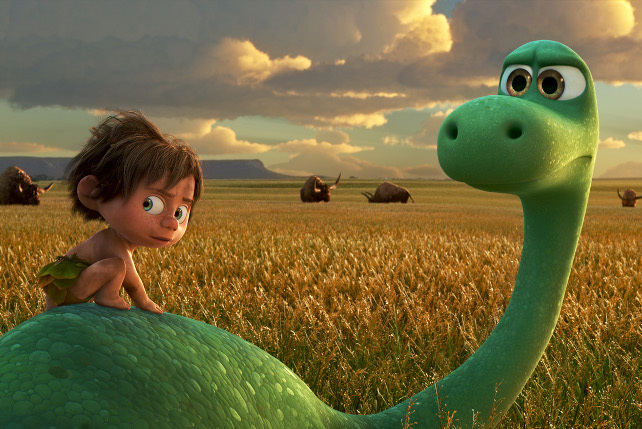 The Good Dinosaur is now showing in theaters. Photos courtesy of Disney-Pixar.